Although you can train your dog without the use of treats, adding them into your training session can actually motivate him a lot. The problem is, looking for the right dog treats can be a bit overwhelming, considering the number of dog treats out there on the market. Throughout this article, we’re going to look at some of the best dog training treats you can buy. We’ll also guide you through the factors you should consider when you shop for a dog food and treat for your furry friend. It can’t be denied that using dog treats correctly will help make the training process a lot easier and more effective, especially when you also combine it with other effective reinforcement training techniques. By giving your dog some delicious treats after he managed to successfully perform a task you want him to do, it will serve as his motivation to keep doing whatever you want him to do as it could also mean that he’ll get even more treats for doing so. Aside from that, treats also work well in giving your dog that extra boost of energy they need, especially during training sessions. Another importance of dog training treats is that they help you save time. Considering the hectic schedules most of us have nowadays, we’re only left with very little time to prepare homemade treats for our little furry friends. If you’re passionate about making homemade treats for your pet, then go ahead and make them. However, if you don’t have that much knowledge, experience, and time, then you have the option of using bought treats instead. When you look for the best dog treats for training, you have to consider the following factors so you can find the right product for your furry friend. It’s pretty important to consider the size of the treats you’re planning to buy for your dog. Going for smaller treats to give your dog right after training would be ideal. It’s because you want to prevent him from getting full as early as possible since this can cause him to gain weight quickly. Also, training your dog when he’s full won’t be effective. Ideally, you want to make sure you limit the number of treats you give him to keep him wanting for more. Smaller treats are important to keep them in shape and maintain their energy throughout the training without unnecessarily exhausting them early on. Aside from being small, a training treat should be easy to swallow. That only means you should also go for soft treats since you don’t have to wait for him to finish chewing. This is also why dog trainers avoid using bigger and crunchy treats since it will take time for their dogs to finish eating. The taste of the treats you want to give your dog will depend on his preferences. For example, some dogs will go crazy for a watermelon-flavored treat, while others would prefer treats that have a meaty taste. As such, you’ll have to know your dog well so you can come up with the best-tasting treat. Even if you have the best treats for dog training, they won’t be really effective if your dog won’t enjoy the flavor. This is why you should know what flavors and taste your dog enjoys then look for treats with those flavors. In most cases, dog treat manufacturers often have a wide range of flavors so you can choose the right one for your furry friend. 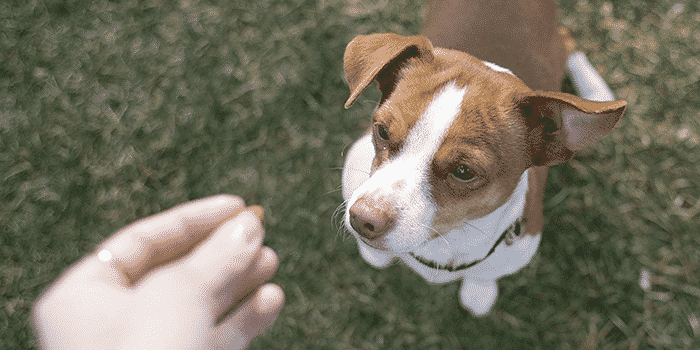 If you’re a new owner and don’t have a lot of experience when it comes to your dog’s favorite flavor, you can try buying treats in small amounts for him to try. If he doesn’t like it, go try another flavor until you can figure out the taste he prefers. Of course, you don’t just give your dog a treat based on its taste alone. You should also consider the nutritional value it has. In fact, this is perhaps the most important factor that will help you determine the best training treats for your dog. Before you decide on a dog treat product, make sure you take a good look at its nutritional profile first. Is it rich in vitamins? Does it have a lot of minerals in it? Does it have the essential nutrients needed by your pet? Just keep in mind that a dog treat’s nutritional profile is not to be taken lightly, since giving a well-balanced and nutritious treat can help boost your dog’s overall energy and performance. Meanwhile, a dog treat with poor nutritional value can adversely affect his diet and even overall health. Aside from taste, smell also plays an important role in choosing the best treats for your dog. As you train your dog, you want to capture his attention for a long time, and there’s a better way to achieve this than a smelly treat. For dogs, a smelly dog treat would simply mean a delicious one. Also, he should also correlate to your level of tricks. In other words, as the tricks get even harder, the treats should also be tastier and smellier. In order to get a better result, you want to save the smelliest and tastiest treats for the hardest tricks. This will prompt your pet to work even harder and faster than before. Aside from a dog treat’s nutritional value, you should also consider if it’s a healthy option or not. By healthy, it means that you should avoid a product which contains artificial colors, preservatives, and synthetic ingredients. A part of checking the ingredients is being cautious of what a certain dog treat consists of. That said, you’ll have to do a research on the harmful artificial preservatives and colors which you might find in some products on the market. 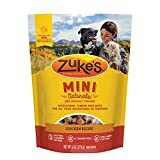 If you’re looking for a dog treat with a low calorie count, then you want to consider Zuke’s Mini Naturals. Available in tiny bite-size treats, the Zuke is the perfect choice for a treat when you go training your dog. Each treat can be consumed in mere seconds, allowing your dog to resume training right after eating. Also, the fact that it’s got a low calorie count means you don’t have to worry about your dog experiencing unexpected weight gains. Additionally, it doesn’t contain any corn, soy, or wheat, making it safe for dogs with dietary restrictions. 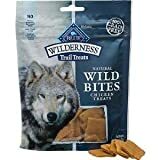 The Blue Wilderness from Blue Buffalo is an excellent choice of a treat for training your dog. It uses 100% all-natural ingredients which are rich in omega 3 and 6 fatty acids that help boost your dog’s energy levels and alertness. That aside, it’s also really tasty and doesn’t include any artificial flavors or preservatives. 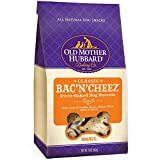 Available in a wide variety of sizes and flavors, the Old Mother Hubbard dog treats will certainly capture the attention of your pet. There’s a total of 11 delicious flavors to help you choose which one suits your dog’s preferences when it comes to taste. Aside from that, it comes in bone shapes which your dog will surely like. It’s also made of all-natural ingredients and only uses high-quality protein, vegetables, and fruits. 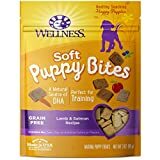 Designed mainly for puppies, the Wellness dog treats deserve to be considered as one of the best puppy training treats on the market. The treats are available in tiny, square shapes which are neither bulky nor too dense, making them very easy for a puppy to swallow. It’s made of natural ingredients including chicken, lamb, apples, salmon, and a lot more. Also, you can choose between crunchy chicken & carrots or soft lamb & salmon. With its natural ingredients and a healthy amount of protein and other healthy fats, you can guarantee that your puppy will develop strong muscles and bones as he grows. This dog treat product from Rocco & Roxie prides itself as one of the best-tasting dog treats on the market. It’s made of all-natural ingredients and comes in a number of flavors which your dog will surely love, including beef, turkey, and chicken. Due to its all-natural formulation, it doesn’t contain any artificial flavors and preservatives, making it a really healthy choice for your pet. Also, the treats are soft, making them a favorite among a lot of dog owners. If you want a soft, chewable dog treat for your furry friend, then the Cloud Star chewy treat is the one for you. Each of the treats is as big as a pea, not to mention it’s very soft so even puppies can easily chew on it. There’s an assortment of flavors you can choose from, allowing you to choose the flavor that suits your dog. 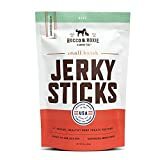 The treats also have low-fat content, which only means you can find a ton of them without having to worry about upsetting your dog’s stomach or making him gain unexpected weight. Designed for training purposes, the Soft & Chewy treats from Hill’s Science Diet contains only high-quality and all-natural ingredients. They’re rich in vitamins, minerals, amino acids, and proteins without any of the artificial ingredients which are detrimental to your dog’s health. You can also find healthy grains and fruits and vegetables included in the formulation. That aside, each of the treats is triangular in shape. The Buckley treats are a US-made product which is both grain and gluten-free. 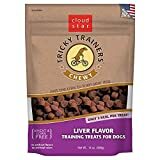 Aside from that, it also has a low-calorie count with only 4 calories for each treat, making the treats ideal for training dogs of any size and breed. Also, like any products we have on this list, this one also doesn’t contain any artificial flavors and preservatives. One of the unique aspects of the Fruitables treats is that they’re infused with a fruity flavor which is combined with meat. That said, they are low in calories which make them perfect for training. Also, the choices of flavors include apple bacon, watermelon, grilled bison, pumpkin & berry, pumpkin & mango, and rotisserie chicken. This only means you can choose which among the flavors your dog prefers. Considering its ingredients, it’s obvious that it’s an all-natural product which is also gluten-free at the same time. 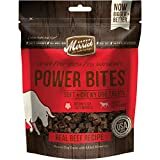 The Merric Power Bites is, as the name implies, a gluten-free formulation which is perfect if your dog is suffering from allergies. Considering that the treats are made of all-natural ingredients, you don’t have to worry about your dog suffering from health issues due to munching on treats with artificial flavors and preservatives. Also, there are eight different flavors you can choose from including chicken, beef, salmon, and turducken to name a few. 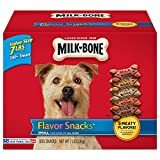 Although these dog treats from Milk-Bone aren’t really made of milk, they do contain a huge amount of protein along with a number of vitamins and minerals which are important to maintain your dog’s overall health. Aside from that, the treats can also help improve insulin activity in your dog’s body, making them the ideal dog treats for dogs suffering from diabetes. Before you start giving your dog some treats each time you go training, you should first figure out his nutritional needs. That said, you have to know his weight so you can determine the number of treats you’re giving. Fortunately, most of the products on this list contains very little amount of calories. Still, comparing your dog’s metabolism and the number of calories he can burn in a single day to the number of calories he needs to eat will let you determine just how much calories worth of treats you should give him.